AmeriCaption has provided real-time broadcast closed captioning services since 1990 for various city and county government meetings, local PBS programming, entertainment shows, local news, and preseason football games. As qualified real-time captioning experts, we can assist our clients in complying with the FCC Quality Rules and Guidelines. AmeriCaption can also provide various post-production caption files, such as .scc and .mcc files, along with numerous Web formats. AmeriCaption is a provider of CART and captioning services both remotely and on-site. AmeriCaption gives every job the attention it deserves because we believe in providing the highest quality accessibility. We do relevant research prior to an assignment, continued with follow-up review after the assignment. Our well-informed captioners draw upon their skills of accuracy and speed to deliver reliable and consistent captions from start to finish. Dee was the first closed captioner for the nationally syndicated program “Daytime” from 2006 through December 31, 2014. 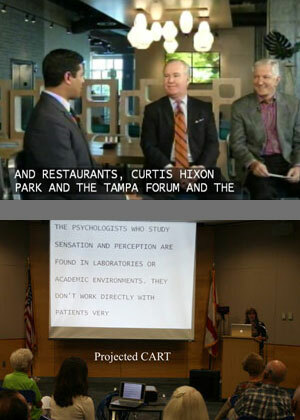 As a result of corporate mergers, Riverbank Studios and WFLA were forced to use a different closed captioning company beginning January 1, 2015, because of an existing closed-captioning contract with the new parent company.